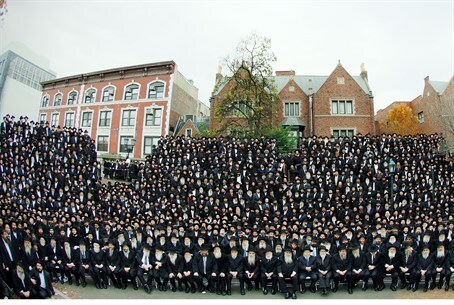 Nearly 4,000 rabbis from around the world gather at Chabad-Lubavitch headquarters in NY for international conference. 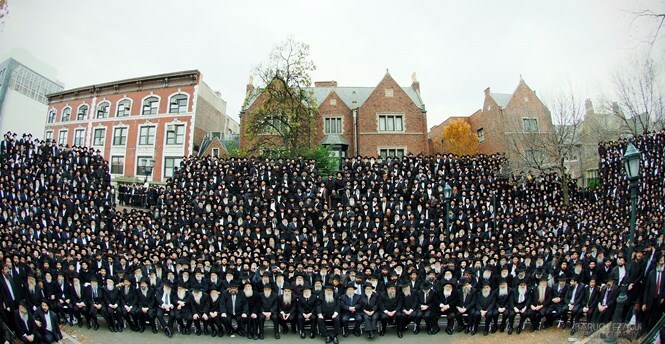 Nearly 4,000 rabbis gathered Sunday in New York at Chabad-Lubavitch world headquarters to participate in the International Conference of Chabad-Lubavitch Emissaries ("Shluchim"). The Conference, held at 770 Eastern Parkway, Brooklyn, is an annual event with the goal of reviving Jewish awareness and practice around the world. The events of the conference included a visit to the tomb of the late Rebbe of Lubavitch, a proffesional conference at the New York Marriot hotel, and a Gala Banquet at the South Brooklyn Marine Terminal. In a recorded message Israeli President Shimon Peres praised the Hasidic movement, saying Chabad rabbis arrive to all parts of the globe to save souls and teach Torah, "sometimes in conditions of mortal danger." Indeed Chabad emissaries have been the targets of anti-Semitic terrorist attacks in the recent past. In 2008 the Chabad House in Mumbai, India was targeted by Islamist terrorists, and Rabbi Gavriel Holtzberg, his wife Rivka and four others at the center were murdered. That attack was part of a concerted assault which ultimately left 166 people dead in the city. Chabad Rabbi Ovadia Isakov was similarly attacked in Russia in July, also by an Islamist terrorist. Despite being shot, Rabbi Isakov survived the attack and arrived at the New York gathering on Sunday. After the attack, Chief Ashkenazi Rabbi David Lau visited Rabbi Isakov in the Intensive Care Unit and agreed to visit him in Derbent, Russia after his recovery, so as to witness his work first-hand. Chabad has played a very active role as a base of Jewish life in far-flung areas of the world, acting as a type of support net for Jews. In fact, amid strikes and the closing down of its diplomatic institutions abroad, the Israeli Foreign Ministry in June advised Israelis around the world to be in touch with their local Chabad House for support instead of Israeli embassies or consulates.